When NASA was looking to build a cart to move equipment used in the servicing of their jet engines, it became apparent that the push/pull forces necessary to move the 2000 pound cart raised the potential for employees to sustain musculoskeletal injuries during transport. 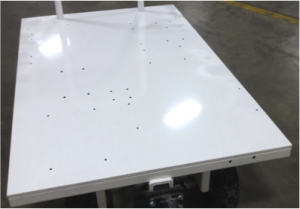 To eliminate these safety issues, NASA came to Electro Kinetic Technologies to develop a custom motorized cart solution that would allow them to mount all of their equipment in the exact location necessary to conduct their service operations, while creating a safe working environment for their employees by eliminating the excessive push/pull forces. Working with NASA’s engineering group, the size of the platform was designed to accommodate all of the equipment. Once the equipment was located on the platform top, 30 to 40 tapped holes were added in exact locations so that NASA’s equipment could be mounted securely onto the platform. The engineering groups exchanged several concepts before the final layout of the ½ inch steel plate top was approved by NASA engineering. 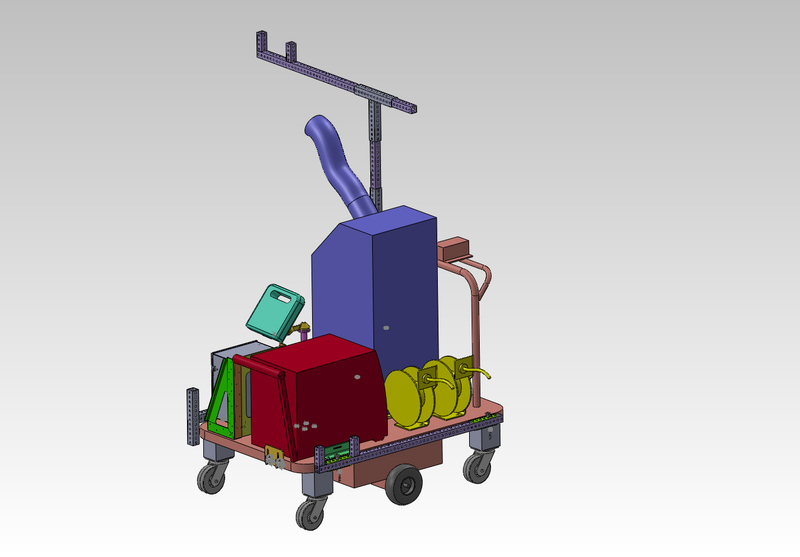 A drive and battery system with enough power to move this cart as well as another manual cart. An easy pintle & hook system to connect and disconnect the two carts. All electronics including variable frequency drive control, batteries and charger housed in an easily accessible, locked drawer. Customized acceleration and speed profiles matched to NASA’s requirements. 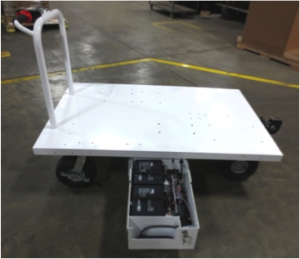 In the end, the supplied carts met all of the design requirements of NASA, including the mounting of their equipment on a custom motorized cart that provided a safe working environment for their employees during transport.